Salmo’s Economic Development Standing Committee, made up of three Council members and three local entrepreneurs, met last night and endorsed two exciting new developments for Salmo. 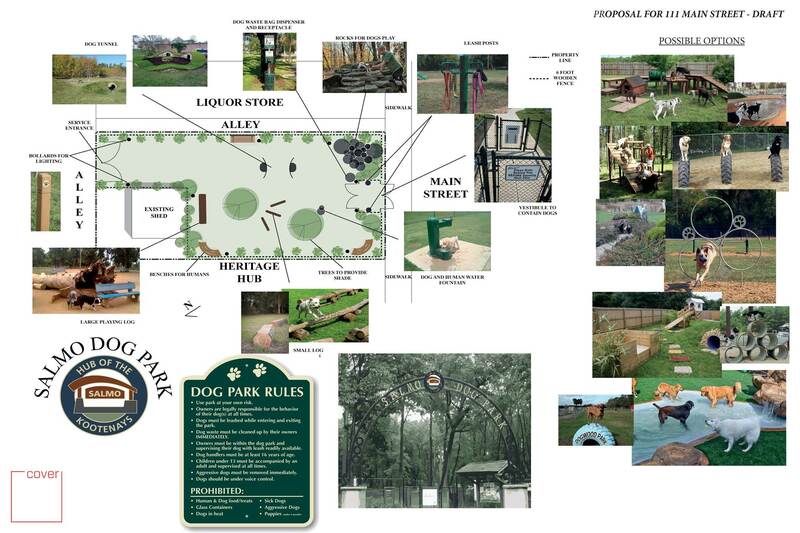 The first was a concept design of a dog park for an abandoned lot maintained by the Village at 111 Main Street. The second was the initiation of a heritage conversation program for Salmo that identifies and preserves the community’s physical, cultural and social assets. CAO Kalen-Sukra presented a concept design of the dog park proposal for 111 Main Street that arose from the last meeting of the Economic Development Committee. Committee members discussed the cost, level of contamination and permitted uses as determined by the property owner, Imperial Oil, who gave the Village limited options for uses on the property. They were: community garden, outdoor plaza or open garden, such as Railway Garden. The Village presented the dog park proposal to Imperial Oil and they agreed and are also willing to pay for the demolition of the existing home on the property. Committee members described the current condition of the lot to be an eyesore and how a dog park may meet community, business, and tourist needs – not to mention the needs of our four-legged friends. Heritage Program Manager Laura Saretsky of Heritage BC delivered a presentation on developing a municipal heritage program, definitions, legislation and best practices in heritage conservation. She described how heritage is a concept much broader than just formal designation of historic buildings but includes the preservation of any physical, cultural or social resources that are unique to and valued by a community. She introduced the various tools available, such as the development of a heritage register and how to establish what a community’s heritage values are. Ms. Saretsky responded to questions from Committee members and advised there is currently no funding stream, as there may have been in the 1990s, for the revitalization of private buildings. She further advised that the process for having a building formally designated as “heritage” is established when a municipal heritage conservation program is in place. The two recommendations will come before Council at the October 10th Regular Council meeting. The Salmo Economic Development Standing Committee (EDSC) makes recommendations to Council on matters relating to the economic well-being of the Village of Salmo and makes recommendations to Council relating to the economic development of Salmo. The EDSC is focused on the retention and expansion of existing business, attracting new investment and promoting Salmo as an ideal place to live, work and play. It may also make recommendations to Council on matters related to the strengthening of the Village’s local economy and contributing to strategic business planning.